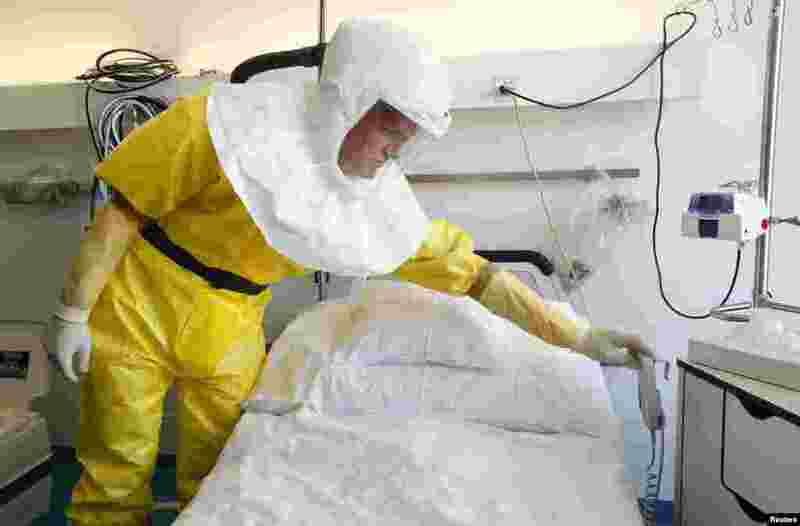 1 Infection control nurse Heinz Schuhmacher wears a protective suit during a media presentation at an isolation ward for possible Ebola patients at of the Universitaetsspital Basel hospital in Basel, Switzerland, Oct. 15, 2014. 2 Spanish Health Minister Ana Mato answers a question in parliament about the Ebola crisis, in Madrid, Oct. 15, 2014. 3 Army Stf. Sgt. 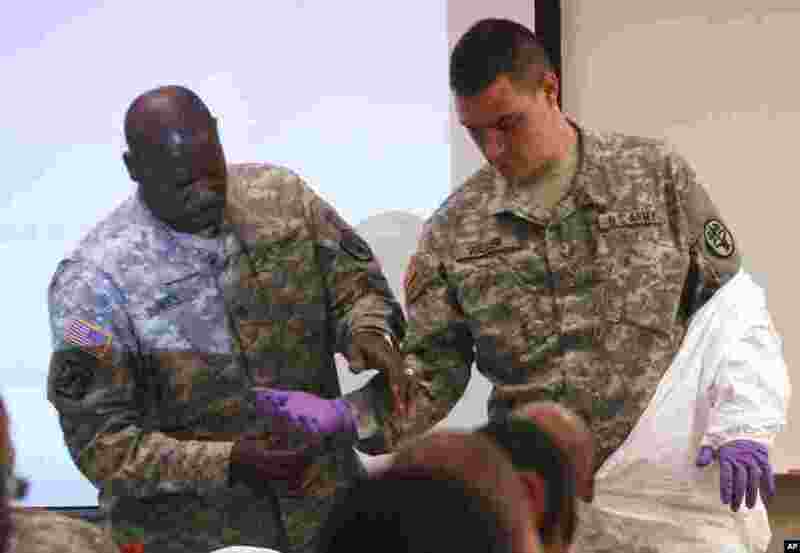 Samuel Hines (left) helps Cpl. Zachary Wicker tape gloves to his uniform in Fort Bliss, Texas, Oct. 14, 2014. 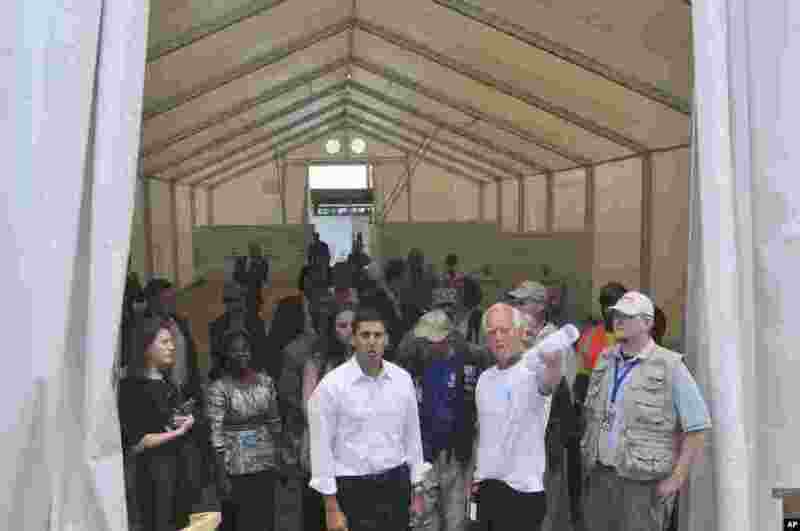 4 Rajiv Shah, the head of USAID, inspects a newly-built Ebola treatment center in Monrovia, Liberia, Oct. 14, 2014. 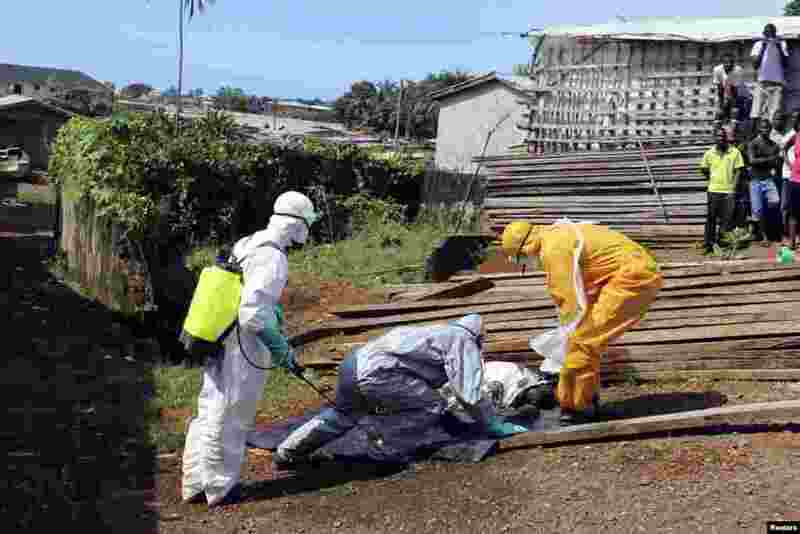 5 Health workers remove the body a woman who died from the Ebola virus in the Aberdeen district of Freetown, Sierra Leone, Oct. 14, 2014. 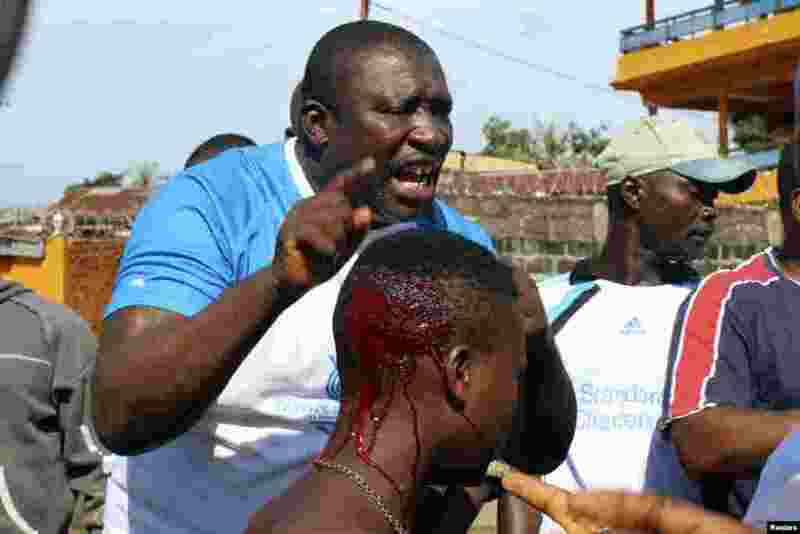 6 A woman bleeds from the head after being struck by a police officer after residents placed roadblocks on the street to demand faster removal of dead bodies infected with Ebola virus in the Aberdeen district of Freetown, Sierra Leone, Oct. 14, 2014. 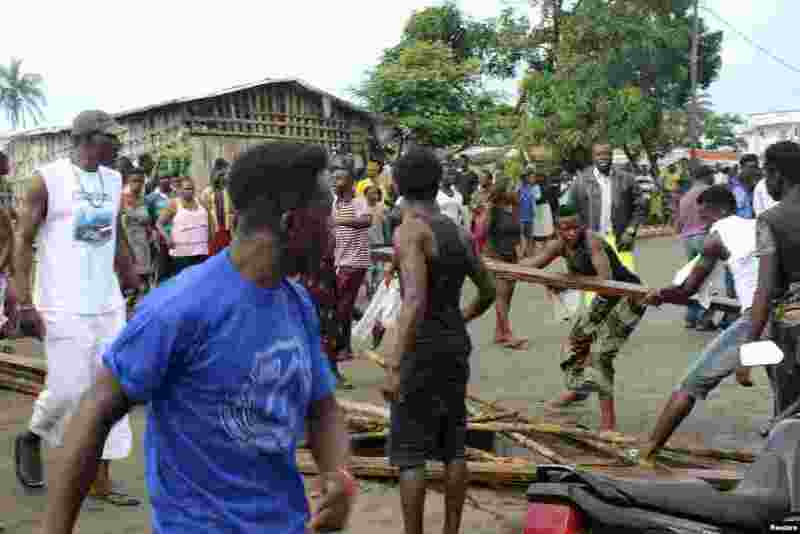 7 Residents place roadblocks on the street to demand faster removal of dead bodies infected with the Ebola virus in the Aberdeen district of Freetown, Sierra Leone, Oct. 14, 2014. 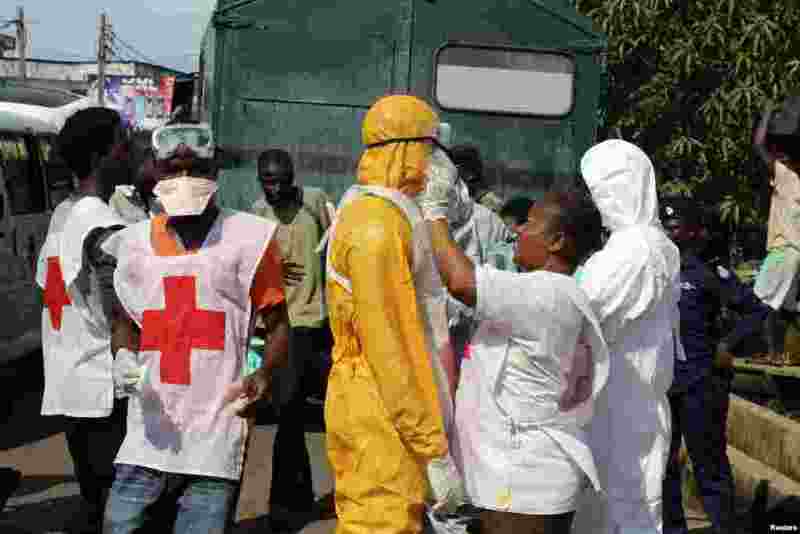 8 A health worker fixes another's protective suit in the Aberdeen district of Freetown, Sierra Leone, Oct. 14, 2014.